And that seems to me to be the really interesting possibility for widgety goodness - adding information and social networking to products, not to marketing; making things smarter, not websites. And I suspect this means moving away from screens at both ends of the process. It means delivering smarts and information to the things in our pockets. It means getting things to talk, and to listen. And smell, and everything. 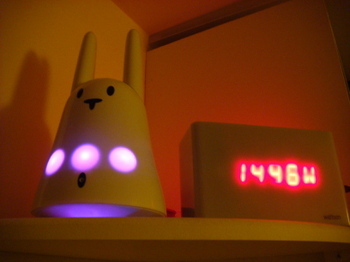 Widgets make sense when they're sending meaning and fun to ambient devices, to things like Nabaztag and Chumby. Or when the socialness is built in with things like Olinda. This, I bet, is how widgetness will really escape the dreariness of services and transaction. By making magical things. Think of the joy of that. Widgets might become the way that our spimes talk to us. And they might actually talk. Widget makers will be the people who work out effective sound-design for ambient information. Or they'll build an interface we can understand just via touch. That seems the big opportunity for the widgety industry - to escape the little boxes on websites and build connectivity and socialness into the world of products, things and people. Anyway. That's it. Like I say, early thoughts, but I enjoyed the day at WidgetyGoodness. Thanks Ivan. Man, great stuff! I think you just elegantly put into words and pictures what's on a lot of people's minds. interesting comments about brand utilities/widgets. I have seen it as something quite simple and an easy progression. The service is addressing a need greater than that of the product. Advertising has done this through addressing an emotional need which is now being activated through a service. Not just talking the talk but walking the walk. Nike is about better running shoes. Nike Plus is about Better running. I think like advertising now... there will be good and bad. Its about looking at the services that are delivered from the likes of dopplr and identifying what emotional need clients want to address to stand out... bringing people together... then using the rational info of the back of it to drive your brand. The number of air miles and finding your best customers. Very simple, sellable and true. Nice way to end the year. Whenever I am running low on hope and inspiration I just have to head over to your blog, thank you. This is a brilliant way to go into the holidays. Great series of posts! Really like the delineation between value creation versus value extraction. Or said in another way - the transaction drivers versus desire drivers. These posts got me thinking that it’s an interesting time when you look around the blogosphere and the marketing publications. The death of the thirty second dogma is dying away, finally. And consensus if forming that digital is the next territory for creative (re)evolution. Much of the digital work out there right now is pretty and well designed but lacks anything remarkable in the way of an idea, profound mental associations, psychologically satisfying usefulness or real usefulness beyond what a brochure can provide. Whether it’s adding real value to brands or finding new ways of creating experiences and telling stories around brands those who are actively figuring it out and pushing into that territory are poised to be the big winners. - and human nature doesn't change that much from one generation to another. - teenagers and people in their early 20's, in particular, are surely more, instinctively, concerned about experience than gathering information. Have to go but will be back ... (if anyone is interested). Also wanted to say, how much do people really want information (in ads)? - car ads now are all about emotions / atmosphere not information (cars, nowadays, all tend to work pretty well - unlike cars, say back in the 70's). Take the Skoda ad where factory workers make a car out of cake to a Julie Andrews song from the Sound of Music. The Guinness ads based on the big idea that it is intrigueing and exciting to wait for a pint of Guinness being poured are obviously very much about emotions / atmosphere, not information. Of course this is an extreme example of where emtional / atmospheric advertising reigns supreme. And, of course, there are many brands nowadays that rely on information about them being communicated to consumers (in particular new types of technology) but overall, I don't think that we should take advertising too seriously just because we have some very serious and nifty technology through which to communicate brand values to consumers. Technology changes and moves on. But people pretty much, at the end of the day, stay the same (Dicken's 'Facts, Facts, Facts' appling as much to the world today, as the world 150 years ago, and so on).